What is it going to take to restore the Chesapeake Bay? Every person and every tributary in the watershed. What will it take to restore the stream where you live? Every person and every tributary. Elizabeth Buckman, Vice President for Communications with the Chesapeake Bay Foundation asked me to write a “Reflection” piece for their signature magazine Save the Bay. Editor Loren Barnett, Managing Editor Jennifer Wallace and Graphic Designer Alexandra Weil, creative team for the magazine, performed their magic. I hope you will read it and share it. With permission from the Chesapeake Bay Foundation the article is posted here. Click on this link or the image to the right to see the finished product that was published in the Winter 2014 edition of Save the Bay magazine. 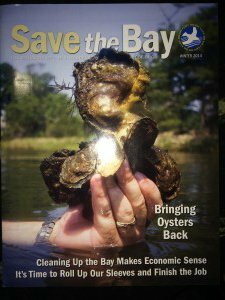 Cover of the winter 2014 edition of Save the Bay magazine. A publication of the Chesapeake Bay Foundation. Click on this image to read the E-edition. Well said Bobby. Thanks for your dedication and inspiration toward a restored bay. Keep up the good works! 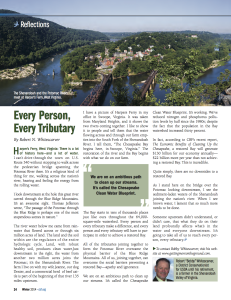 Every person is a tributary. I read your article in the current Save the Bay and was glad to see that you’re still practicing and teaching. It’s been many years since you came to my biology classes in Fauquier County with your Mesopotamia Message. Keep it up!